Cordlock for honeycomb & cellular shades are generally designed to fit the fabric cell size. Most common cell sizes are 3/8" and 3/4"
Larger cell size like 1 1/4" is used on very large window. Comfortex Small Cord Lock for 3/8" Cellular Shade. 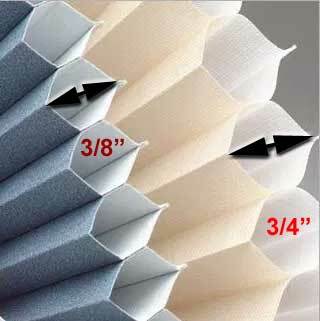 Width is 1.5"
Small Cord Lock 3/8in for Comfortex Honeycomb, Cellular, Pleated Shade. Can be used for both Left & Right. Comfortex Large Cord Lock for 3/4" cellular Cellular Shade. 2" width. Large Cord Lock 3/4in for Comfortex Honeycomb, Cellular, Pleated Shade. Cord Lock for Verosol Honeycomb, Pleated Shade. Recommended string to use with this cordlock is 0.9mm. Cordlock for 3Day-Blind, Bali, Graber & other brands. For Cellular, Pleated or Honeycomb Shade. Newly redesigned with metal reinforced cord guide to protect your strings from sharp abrasions. Select LEFT or RIGHT. Cord Lock for 3Day-Blind Honeycomb Shade.